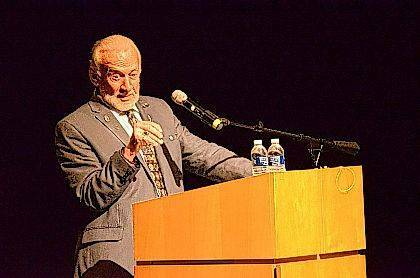 Buzz Aldrin addressed a packed auditorium Saturday at the Wapakoneta Peforming Arts Center as part of the Summer Moon Festival. WAPAKONETA — Buzz Aldrin spoke to an auditorium packed with people Saturday afternoon at the Wapakoneta Performing Arts Center as part of the Summer Moon Festival. Aldrin was greeted by the crowd with thunderous applause and cheering as he walked across the stage to the lectern. Aldrin told the story of how he first met Neil Armstrong; in the backyard at a friend’s house roller-skating on the cement. “I took my first flight at age 2 with my father and Jane Aldrin in a single-engine paraglider painted to look like an eagle,” he said. Aldrin went on to talk about his time in the military. He served as a fighter pilot in the Korean War, flying 66 combat missions. After the war he was stationed in Germany in the late 1950s, he received gunnery training in Las Vegas and then was admitted into the Air Force Academy, he said. After that he was assigned to the 22nd squadron in Germany. The squadron was later stationed in Libya for gunnery training. Later Aldrin talked about his time at MIT and NASA. His doctorate dissertation at MIT was on techniques for using line-of-sight guidance to rendezvous with manned orbital objects. That is how he got his nickname “Dr. Rendezvous,” he said. “Little did anyone know, especially me, how important my work was going to be,” Aldrin said, adding his research was going to be used to work out landing and rendezvousing manned spacecraft. He did not get into to NASA on the first try, but he said he didn’t give up. This tenacity lead him to the Apollo program and being one of the first men on the moon. Aldrin said, as he stepped onto the moon for the first time he thought about the ingenuity that led to that place and all of the hard work. In closing, he said he believed Mars is the next step into space for humanity but we can’t reach it alone. He said we need to work together with other countries to reach that goal.